John Brunner’s novel The Squares of the City encodes an 1892 chess game between Wilhelm Steinitz and Mikhail Chigorin. Richard D. Logan and Tere Duperrault Fassbender, Alone: Orphaned on the Ocean, 2011. “The Sea: The Bluebelle’s Last Voyage,” Time, Dec. 1, 1961. Herbert Brean, “The ‘Bluebelle’ Mystery,” Life, Dec. 1, 1961. Erle Stanley Gardner, “The Case of the Bluebelle’s Last Voyage,” Sarasota Herald-Tribune, March 25, 1962. “Shipwrecked Girl, 11, Rescued After 4 Days on Raft in Atlantic,” United Press International, Nov. 17, 1961. “Skipper Is Suicide After Yacht Wreck,” United Press International, Nov. 18, 1961. “Yacht Girl Rallies,” New York Times, Nov. 19, 1961. 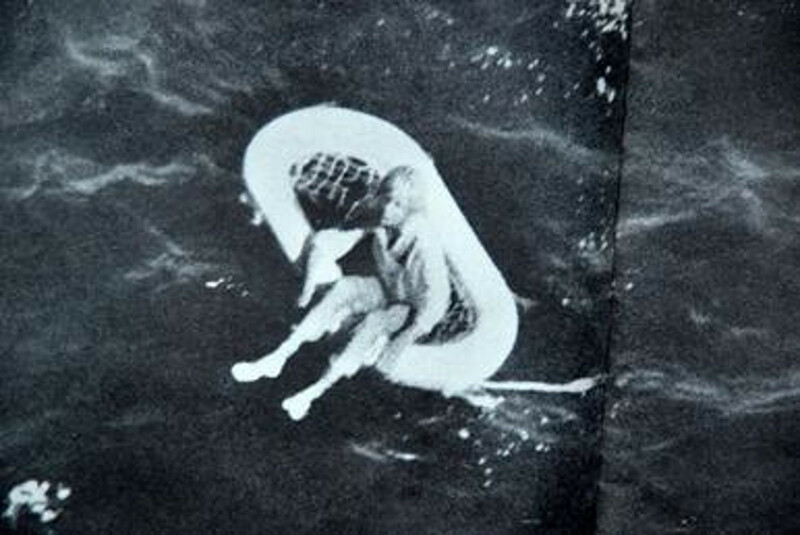 “Yacht Girl Questioned; Survivor of Sinking Reported on Way to Full Recovery,” Associated Press, Nov. 20, 1961. “Rescued Girl’s Story Indicates Skipper Killed Others on Yacht,” Associated Press, Nov. 21, 1961. “The Mystery of the Bluebelle,” New York Times, Nov. 22, 1961. “Dead Skipper’s Papers Are Held by Court Order,” Associated Press, Nov. 22, 1961. “Rescued Skipper Showed No Grief,” Associated Press, Nov. 23, 1961. “Yacht Survivor Hears of Deaths,” United Press International, Nov. 24, 1961. “Bluebelle Survivor Tells Story Again,” United Press International, Nov. 28, 1961. “Coast Guard Rules Harvey Was Killer,” Associated Press, April 26, 1962. “Bluebelle‘s Owner Sued in Deaths of 4,” Associated Press, April 28, 1962. Mary Ann Grossmann, “‘Alone’ Book Recounts Green Bay Girl’s 1961 Ordeal at Sea — and Life After,” Saint Paul Pioneer Press, May 30, 2010. John Bogert, “The Tale of the Bluebelle Still Captivates Decades Later,” [Torrance, Calif.] Daily Breeze, May 26, 2010. Marlene Womack, “Out of the Past: The Mystery of the Yacht Bluebelle,” [Panama City, Fla.] News Herald, Nov. 10, 2014. Wikipedia, “Isle of Man” (accessed June 28, 2018). Wikipedia, “Geography of the Isle of Man” (accessed June 28, 2018). Wikipedia, “Wallaby” (accessed June 28, 2018). Wikipedia, “Red-Necked Wallaby” (accessed June 28, 2018). “Searching for the Isle of Man’s Wild Wallabies,” BBC News, Oct. 17, 2010. “Isle of Man Wallaby Population ‘Increasing,'” BBC News, Sept. 16, 2014. Nazia Parveen, “Wallabies Flourishing in the Wild on Isle of Man,” Guardian, Aug. 14, 2016. Christopher Null, “Hello, I’m Mr. Null. My Name Makes Me Invisible to Computers,” Wired, Nov. 5, 2015. Associated Press, “Apostrophe in Your Name Can Cause a World O’Trouble,” February 21, 2008. Anna Tims, “I Was Denied Boarding a Plane — All Because of a Hyphen,” Guardian, April 27, 2018. Tim O’Keefe, “Apostrophe in Name Causes Computer Chaos,” April 29, 2016. Freia Lobo, “Here’s Why Airlines Have Trouble With Your Hyphenated Name,” Mashable, June 25, 2017. John Scott-Railton, “#HyphensUnite: A Decade of United Airlines Ignoring the Hyphenated,” June 21, 2017. Click consonants are speech sounds that occur as consonants in Southern and East African languages. This week’s lateral thinking puzzle was contributed by listener Mike Wolin, who sent these corroborating links (warning — these spoil the puzzle). You can listen using the player above, download this episode directly, or subscribe on Apple Podcasts or Google Play Music or via the RSS feed at http://feedpress.me/futilitycloset.